A symbiotic blend of essential oils of Lavender, Spearmint & Tea Tree Oils to enhance the natural healing capabilities of the skin. 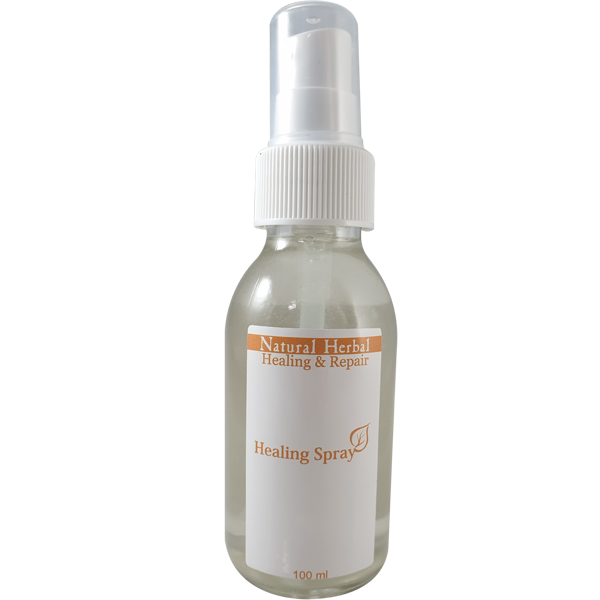 Healing & Repair Healing Spray contains Tea tree oil which is known for its antibacterial and its antiviral properties. It is also known to be the most healing of all essential oils, and has a powerful effect on the skin. Further anti-bacterial properties is enforced with the conjunction of Lavender oil which has a soothing and calming effect on the skin and body. This combination is known to help with the release of spasmodic muscles and general muscle relaxing. Spearmint oil has been added as it is known to reduce the effects of alleviating fatigue, headaches, migraines and nervousness. These oils work in unison to form a uniquely soothing relaxing healing effect on the body and mind. Spray over effected area and leave on. Most effective after a warm bath or shower. Soothes, Heals & relaxes the mind and body.